The City of Avondale Estates is proud to celebrate its 32nd year as a Tree City USA Community. The Tree City USA program, administered by the Arbor Day Foundation in Nebraska, provides the framework for community forestry management for cities across America that meet certain requirements. These requirements include the establishment of a tree board or department, a community tree ordinance, an annual community forestry budget of at least $2 per capita and an Arbor Day observance and proclamation. There are 138 Tree Cities in Georgia and more than 3,400 in the country. Avondale Estates is one of the three oldest tree cities in the state, and one of the few tree cities in DeKalb County. The City was also awarded the Growth Award from the Georgia Forestry Commission. 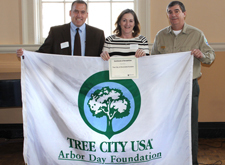 The Georgia Forestry Commission defines cities who receive this award as going, "above and beyond the requirements for urban forestry programs." Both of these recognitions wouldn't be possible without the dedication and tireless effort from the Avondale Estates Tree Board and the City's partnership with Arborguard Tree Specialists. It is because of their efforts that the City has been able to preserve and add to its canopy year after year. In 2015, the Tree Board held their Annual Tree Planting event titled, "Save Our Canopy." Volunteers planted 52 trees throughout the City to create shade, add fall color and visually enhance the road. To celebrate Arbor Day this year, the community is invited to join members from the Board of Mayor and Commissioners, City associates, members of the Avondale Estates Tree Board and members of the Avondale Estates Garden Club (AEGC) as they gather for a tree planting dedication ceremony. The ceremony will be held on Friday, February 19, at 1 p.m. at 22 Dartmouth Avenue. AEGC has again donated funds towards the purchase of the tree.